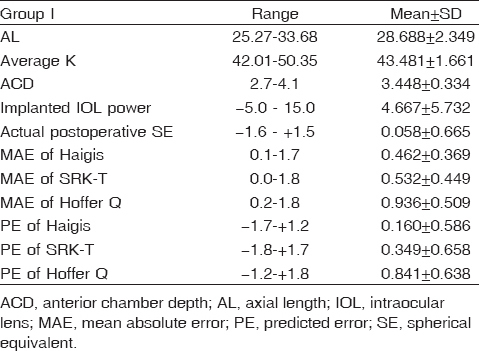 The aim of this study was to compare the accuracy of optical biometry and applanation ultrasound measurement of the preoperative intraocular lens (IOL) power calculation formulas (Haigis, SRK/T, and Hoffer Q) of highly myopic eye. Implantation of an IOL is the cornerstone in modern day cataract surgery, which is no longer used for just visual rehabilitation but has also become a form of refractive surgery in which the final refractive result can define visual outcome. Accurate biometry necessitates proper axial lens measurements. 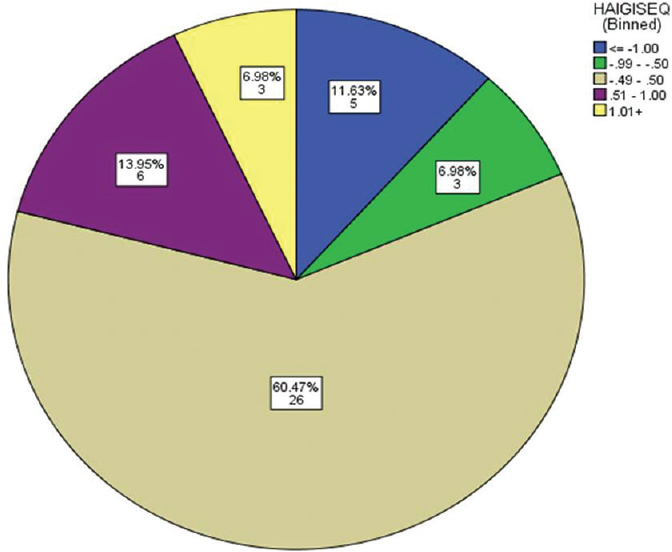 This study included 60 eyes of 52 patients (nine cases of bilateral and 42 cases of unilateral cataract) [27 female (45%) and 33 male (55%)] with extreme myopia and axial lengths longer than 26.0 mm with cataract as the only ocular pathology. Patients were divided into two groups. Group 1 (the optical biometry group) included 30 patients and group 2 (the A-scan ultrasound group) included 30 patients. Eyes with significant cataract suitable for phacoemulsification and primary in-bag implantation of posterior chamber IOL were included. All patients underwent clear corneal phacoemulsification by the same surgeon and implantation of the one-piece soft hydrophobic acrylic IOL (EYECRYL-600L) IOL (power range −5.0.0 to +15.0 D). This study was carried out on 60 eyes of 52 highly myopic patients presenting with cataract. Patients were divided into two groups: group 1, which included 30 eyes that underwent optical biometry using Zeiss 5000 IOL Master, and group 2, which included 30 eyes that underwent A-scan ultrasound biometry using Sonomed PAC SCAN 300 AP. Haigis formula with the Zeiss IOL Master using partial coherence interferometry gives significantly better IOL power prediction in highly myopic eyes with cataract compared with US biometry. Implantation of an intraocular lens (IOL) is the gold standard in modern day cataract surgery. Over the last decade, IOL power calculations have become a focal point of cataract surgery. The accurate calculation of IOL power is essential for attaining the desired refractive outcomes after cataract surgery. The most important factor affecting the accuracy of biometry is the axial length (AL) . Ultrasound measurements (ultrasonography) can be performed by applanation of an ultrasound probe to the cornea or by immersion of the probe in a saline-filled shell. Ideal measurements consist of three readings within 0.02 mm of each other, maximally high, with steeply rising anterior and posterior lens and retina spikes . The measured AL using applanation A-scan ultrasound will be inaccurately shorter with corneal indentation in highly myopic eyes due to globe indentation with incorrect AL measurement and an undesired postoperative refractive outcome. More than 10 years ago, the IOL Master optical biometer was introduced into clinical practice. Over time, optical biometry has replaced ultrasonography as the standard technique for AL measurements of the eye. Optical biometry utilizes a laser for signal transmission. Interference phenomenon between the reflected signal and the reference signal is utilized to determine distances between interfaces. Only data with a signal-to-noise value higher than 2.1 were recorded and were ideal measurements (for the IOL Master). Previous comparisons of applanation ultrasound and optical biometry have reported equal or better results with optical biometry ,. Being noncontact, avoiding globe compression, the measurement of AL with partial coherence interferometry (IOL Master) has been shown to produce significantly more precise IOL power calculation and refractive outcome in cataract surgery. Applanation ultrasound is still considered a common method to measure AL worldwide, especially in developing countries, due to familiarity with the technique and its low cost compared with IOL Master. Our primary objective was to compare three recent IOL power calculation formulas (Haigis, SRK-T, and Hoffer Q) and determine the most appropriate formula for accurate prediction of postoperative refractive error in Egyptian eyes with AL greater than 26 mm indicated to undergo phacoemulsification cataract surgery. This prospective randomized study included 60 eyes of 52 highly myopic patients (27 female and 33 male), of which 30 eyes underwent optical biometry with IOL Master (Zeiss GmbH, Jena, Germany) and 30 eyes underwent biometry with applanation A-scan ultrasound. After obtaining consent, all patients were subjected to detailed history taking and full clinical examination, especially eye examination. Cases were recruited from outpatient clinics. Medical records of these patients who underwent cataract surgery from February 2013 to March 2015 were prospectively reviewed. This study was carried out during a time period from February 2013 to March 2015 in the Ophthalmology Department in Menoufia University Hospitals (ultrasound biometry group patients) and the Memorial Institute of Ophthalmic Research at Giza (IOL optical biometry group patients). The eyes were divided into two groups (A and B). Group B: the applanation ultrasound biometry (A-scan guided biometry) group. Biometry was measured using optical biometry and ultrasound, and IOL power was calculated using the Haigis, SRK-T, and Hoffer Q formulas. Automatic refraction examination was carried out 1 month after the operation, and differences between the two groups were compared and analyzed using mean absolute error (MAE) with the following inclusion and exclusion criteria. Patient's willingness to comply with scheduled visits and other study procedures. Any neurological condition, which may interfere with performance of required tests. Multiple operative procedures at the time of IOL implantation. Presence of other ocular pathologies causing visual impairment that were not apparent before surgery (e.g., age-related macular degeneration, macular edema, glaucoma, and retinal detachment). Optical biometry was performed with the patient seated at the IOL Master and asked to fixate on the fixation target. An applanation ultrasound was performed after instillation of one drop of surface anesthetic (benoxinate hydrochloride 0.4%) on the lower conjunctiva. Phacoemulsification surgery was performed through a 2.3 mm superior clear corneal incision. 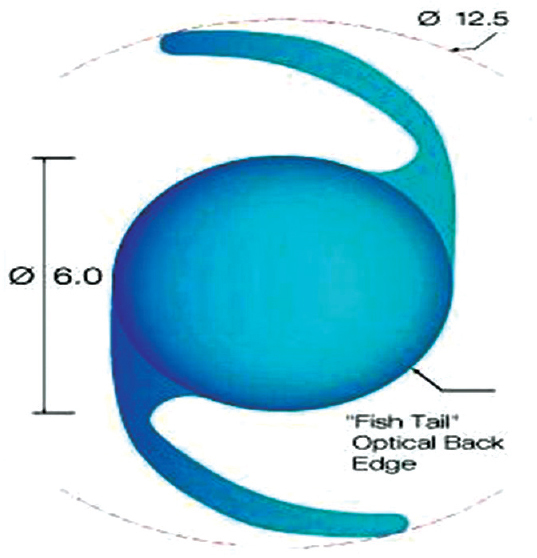 All patients underwent in-the-bag implantation of the same IOL type, which is (EYECRYL-600, Biotech, Moss Vision Inc., Gujarat, India) a one-piece soft hydrophobic acrylic foldable IOL (Lenses Limited, Hove, East Sussex, UK); the specification is presented in [Figure 1]. Postoperative assessment included visual acuity and postoperative SE evaluation for 3 months. The data collected were tabulated and analyzed using statistical package for the social science software, version 16 (IBM Corp., Armonk, New York, USA). Quantitative data were expressed as mean and SD and analyzed by applying Student's t-test for comparison of two groups of normally distributed data. Qualitative data were expressed as number and percentage and analyzed by applying the c2-test. At the end of this study, data were statistically described in terms of mean ± SD, median and correlation, and percentages, when appropriate. All these tests were used as tests of significance at P value less than 0.05. The MAE generated using the Hoffer Q formula was significantly higher than that generated using the SRK-T formula (P < 0.001). In our study, errors in the Haigis formula were as follows: between − 1.00 and 1.00 D in 81.4% of patients; between − 0.50 and 0.5 D in 60.47% of patients; between − 1.00 and − 0.50 D in 6.98% of patients; between 0.50 and 1.00 D in 13.95% of patients; less than −1.00 or greater than 1.00 D in 18.6% of patients; less than −1.00 D in 11.63%; and greater than 1.00 D in 6.98% [Figure 1]. There was a statistically significant association between Haigis formula results and SRK/T formula results (P value less than 0.025) [Table 3]. High errors were in Hoffer Q formula between −1.00 and 1.00 D. The majority was 60.47% and it was between −0.50 and 0.5 D [Figure 2]. Figure 2: Haigis formula errors. There is a significant positive correlation between Haigis formula results and SRK/T formula results (P value of 0.000) [Table 3] and [Table 4]. MAE is often used as an indicator for the IOL formula prediction accuracy; however, the MAE did not show a resulting direction (myopic or hyperopic). In this study, we found that calculation of IOL power using IOL Master resulted in a tendency for hyperopic shifts with all three formulas. This hyperopic shift was minimal with Haigis formula (0.16 ± 0.58 D), followed by SRK-T (+0.34 ± 0.65 D), and was largest with Hoffer Q formula (+0.84 ± 0.63 D). [Table 4] and calculation of IOL power using A-scan biometry resulted in a tendency for hyperopic shifts with all three formulas. This hyperopic shift was minimal with Haigis formula (0.16 ± 0.58 D), followed by SRK-T (+0.34 ± 0.65 D), and was largest with Hoffer Q formula (+0.84 ± 0.63 D). One of the final frontiers in ophthalmology is consistent accurate estimation of IOL powers over a wide range of ALs. It is generally accepted that both theoretical and regression IOL formulas perform well for eyes of average ALs (22.0–24.5 mm). However, precise biometry prediction in extremely short and long eyes has always been difficult . The measurement of AL with partial coherence interferometry (IOL Master) has been shown to produce significantly more precise IOL power calculation and refractive outcome in cataract surgery, thereby avoiding possible compression of the eye with applanation A-scan ultrasound and difficulty with immersion A-scan ultrasound in AL measurements . The IOL Master provides all biometric parameters and various formulas for IOL power calculation. The system uses dual-beam partial coherence interferometry, which improves the refractive results in cataract surgery patients . The disadvantage of the first optical biometer (e.g., IOL Master) in common clinical use was the inaccurate measurement in cases of media opacities such as corneal scar and dense vitreous hemorrhage, but newer versions of the IOL Master and other optical biometers (e.g., AL-scan; NIDEK Co. Ltd, Gamagori, Japan and Lenstar; Haag-Streit Group, Koeniz, Switzerland) may be more powerful . 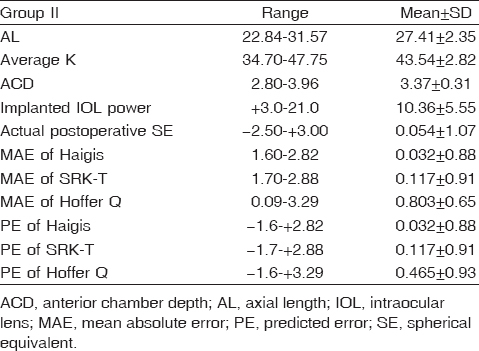 We tried in our study to evaluate the performance of different recent IOL power calculation formulas (SRK-T, Hoffer Q, and Haggis) in predicting a target postoperative refraction in very long eyes (ALs>25 mm) using the PCI technique. An error of prediction (PE) was derived for each eye to show the tendency of prediction performance using the three formulas. The PE is the actual postoperative SE minus the target postoperative SE, and it reveals how close the actual postoperative refraction of each eye is to the target postoperative refraction. The sign of the PE denotes the direction of the departure from the target. In other words, a negative PE value means that the patient ended up with a more myopic refraction than intended, whereas a positive PE value means that the patient ended up with a more hypermetropic refraction than intended . The MAE was also derived for each eye. This is the absolute value of the PE of each eye and denotes the distance of the refraction from 0, without taking into account whether the departure from 0 was in the myopic or hypermetropic direction . Several studies evaluated the accuracy of various IOL power calculation formulas that used optical biometry data obtained from assessments of eyes with short AL. Roh et al. found that the performance of the Haggis formula was better than that of the Hoffer Q and SRK/T in 25 eyes with AL shorter than 22 mm. Maclaren et al. selected 76 eyes undergoing cataract surgery with IOLs ranging in power from 30 to 35 D. They found that Haggis was more accurate for open-loop, whereas the Hoffer Q was more accurate for plate-haptic lenses. However, in assessments obtained from eyes with long AL, several studies evaluated the accuracy of various IOL power calculation formulas that used optical biometry data. Bang et al. reported that Haggis formula was the most accurate in predicting postoperative refractive error comparing with the Hoffer Q, Holladay 1, Holladay 2, and SRK/T for 53 eyes with AL more than 27 mm. A study of more than 300 long eyes, with AL more than 27 mm, demonstrated that the performance of the SRK/T was better than that of Hoffer Q and Holladay 1 . MacLaren et al. revealed that Haggis provided the best predictability of postoperative refractive outcome compared with SRK/T and Holladay 1 for 37 eyes with AL more than 26.5 mm. In extremely myopic eyes, in which minus powered IOLs were required, there was evidence suggesting that the Haggis formula performs best in these cases . The Haggis formula performed better than the Hoffer Q, SRK/T, and Holladay 2 formulas in 44 eyes with AL more than 26 mm receiving myopic refractive lens exchange . In another study, the SRK/T and Haggis formulas performed equally well and outperformed the Hoffer Q and Holladay 1 in 34 eyes between 25 and 28 mm; however, when analyzing 34 eyes with an AL of 28 mm or longer, they found that the Haggis formula was better compared with the SRK/T formula . In our study, we discovered a much similar result, on comparing the MAE of the three formulas for patients with AL more than 25.0 mm. The results revealed that the Haggis formula achieved a superior refractive outcome with the smallest MAE (0.46 ± 0.36 D), followed by SRK-T, which also performs well in highly myopic patients, achieving a MAE of 0.53 ± 0.44 D, and, finally, Hoffer Q, achieving a fairly large MAE of 0.93 ± 0.50 D.
Moreover, we found that the postoperative refraction in these long eyes resulted in tendency for hyperopic shifts with all three formulas. This hyperopic shift was minimal with Haggis formula (0.16 ± 0.58 D), followed by SRK-T (+0.34 ± 0.65 D), and was largest with Hoffer Q formula (+0.84 ± 0.63 D). Several studies ,,, proved that there was a postoperative hyperopic refractive error in highly myopic patients with all formulas tested. There are no reports on the cause of this error. The Haggis formula owns superior performance possibly because of its inclusion of the IOL Master-measured ACD . The Hoffer Q and SRK/T are two-variable formulas that rely on AL and central corneal power to predict the postoperative IOL position. Another erroneous assumption of these formulas is that eyes with steep corneas have deep anterior chambers and eyes with flatter corneas have shallow anterior chambers, which is not always true . These probably were the reasons why these formulas were less accurate compared with the Haggis formula in this study. Several ultrasound biometry studies have examined the accuracy of various IOL power calculation formulas in eyes with long AL ,,,,,,,. The SRK II formula has proved to be inaccurate for IOL power calculation in myopic patients ,,,,. Third-generation formulas in eyes with long AL yielded disparate results ,,,,. In a study by Chen et al.,  the IOL power calculated using the SRK/T, Hoffer Q, and Holladay 1 formulas predicted comparable refractive outcomes in 89 eyes with an AL longer than 24.5 mm. The MAE calculated using these three formulas ranged from 0.41 to 0.45 D . In a study of long eyes, Jin et al. found that the SRK/T and Holladay formulas performed equally well. MacLaren et al. reported that the Hoffer Q formula provided the best predicted results in 125 Chinese eyes with high axial myopia. Wang and colleagues reported that the use of IOL Master data with the SRK/T formula yielded the most precise refractive outcome (MAE 0.52 D) in eyes with an AL between 25.0 and 28.0 mm, and the precision of this refractive outcome was comparable to that obtained using the Haigis formula. However, the advent of the IOL Master has not rendered ultrasonic biometry obsolete as a significant number of eyes, ~8–10%, still require ultrasound biometry, which is still essential in every ophthalmic practice . Although the difference was not statistically significant, IOL calculations carried out using the optical biometry were nearly similar in predicting postoperative refraction compared with those of applanation ultrasound. However, more precise measurements may be obtained if the AL is longer than 24.4 mm. Except in the case of opacity in the media, which makes obtaining measurements with the optical biometry difficult, AL-scan could be a useful biometry in cataract surgery. Haigis formula in highly myopic cataractous patients is the best formula with minimal postoperative SE errors as compared with SRK/T and Hoffer Q formula, which shows a tendency for hyperopic shift. We may conclude that IOL measurements performed with the Zeiss IOL Master, using partial coherence interferometry, yielded significantly better IOL power prediction and therefore refractive outcome in cataract surgery compared with US biometry in highly myopic eyes. Byrne SF. A-scan axial length measurements: a handbook for IOL calculations. New York, NY: Grove Park Publishers; 1995. Rajan MS, Keilhorn I, Bell JA. Partial coherence laser interferometry vs conventional ultrasound biometry in intraocular lens power calculations. Eye (Lond) 2002; 16:552–556. Doctor KJ. IOL calculations: when, how and which? Mastering the techniques of IOL power calculations. India: JAYPEE; 2009. 36–45. Sahin A, Hamrah P. Clinically relevant biometry. Curr Opin Ophthalmol 2012; 23:47–53. Ladas JG, Stark WJ. Improving cataract surgery refractive outcomes. Ophthalmology 2011; 118:1699–1700. Chen YA, Hirnschall N, Findl O. Evaluation of 2 new optical biometry devices and comparison with the current gold standard biometer. J Cataract Refract Surg 2011; 37:513–517. Jin H, Holzer MP, Rabsilber T, Borkenstein AF, Limberger IJ, Guo H, Auffarth GU Intraocular lens power calculation after laser refractive surgery: corrective algorithm for corneal power estimation. J Cataract Refract Surg 2010; 36:87–96. Findl O, Drexler W, Menapace R, Heinzl H, Hitzenberger CK, Fercher AF Improved prediction of intraocular lens power using partial coherence interferometry. J Cataract Refract Surg 2001; 27:861–867. Roh YR, Lee SM, Han YK, Kim MK, Wee WR, Lee JH Intraocular lens power calculation using IOLMaster and various formulae in short eyes. Korean J Ophthalmol 2011;25:151–155. MacLaren RE, Natkunarajah M, Riaz Y, Bourne RR, Restori M, Allan BD Biometry and formula accuracy with intraocular lenses used for cataract surgery in extreme hyperopia. Am J Ophthalmol 2007; 143: 920–931. Bang S, Edell E, Yu Q, Pratzer K, Stark W Accuracy of intraocular lens calculations using the IOLMaster in eyes with long axial length and a comparison of various formulae. Ophthalmology 2011; 118:503–506. Aristodemou P, Knox Cartwright NE, Sparrow JM, Johnston RL, Aristodemou P, Knox Cartwright NE, et al. Formula choice: Hoffer Q, Holladay 1, or SRK/T and refractive outcomes in 8108 eyes after cataract surgery with biometry by partial coherence interferometry. J Cataract Refract Surg 2011; 37: 63–71. MacLaren RE, Sagoo MS, Restori M, Allan BD Biometry accuracy using zero- and negative-powered intraocular lenses. J Cataract Refract Surg 2005; 31: 280–290. Roessler GF, Dietlein TS, Plange N, Roepke AK, Dinslage S, Walter P, Mazinani BA Accuracy of intraocular lens power calculation using partial coherence interferometry in patients with high myopia. Ophthalmic Physiol Opt 2012; 32: 228–233. Haigis W Biometry and intraocular lens calculation in extreme myopia. Acta Clin Croat 2012; 51(Suppl 1):65–69. Terzi E, Wang L, Kohnen T. Accuracy of modern intraocular lens power calculation formulae in refractive lens exchange for high myopia and high hyperopia. J Cataract Refract Surg 2009; 35:1181–1189. Wang J-K, Hu CY, Chang S-W. Intraocular lens power calculation using the IOLMaster and various formulae in eyes with long axial length. J Cataract Refract Surg 2008; 34:262–267. Olsen T, Thim K, Corydon L. Accuracy of the newer generation intraocular lens power calculation formulae in long and short eyes. J Cataract Refract Surg 1991; 17:187–193. Zaldivar R, Shultz MC, Davidorf JM, Holladay JT. Intraocular lens power calculations in patients with extreme myopia. J Cataract Refract Surg 2000; 26: 668–674. Tsang CSL, Chong GSL, Yiu EPF, Ho CK. Intraocular lens power calculation formulae in Chinese eyes with high axial myopia. J Cataract Refract Surg 2003; 29:1358–1364. Jin H, Rabsilber T, Ehmer A, Borkenstein AF, Limberger IJ, Guo H, Auffarth GU Comparison of ray-tracing method and thin-lens formula in intraocular lens power calculations. J Cataract Refract Surg 2009; 35: 650–662. Kohnen T. Multifocal IOL technology: a successful step on the journey toward presbyopia treatment. J Cataract Refract Surg 2008; 34: 2005. Wang L, Hill WE, Koch DD. Evaluation of intraocular lens power prediction methods using the American Society of Cataract and Refractive Surgeons Post-Keratorefractive Intraocular Lens Power Calculator. J Cataract Refract Surg 2010; 36: 1466–1473. Haigis W. IOL power calculations. Ophthalmology 2010; 117: 400–401. author reply 401. Van den Aardweg MT, Boonacker CW, Rovers MM, Hoes AW, Schilder AG Effectiveness of adenoidectomy in children with recurrent upper respiratory tract infections: open randomised controlled trial. BMJ 2011; 343: d5154. Lee AC, Qazi MA, Pepose JS. Biometry and intraocular lens power calculation. Curr Opin Ophthalmol 2008; 19:13–17. Casey JR, Adlowitz DG, Pichichero ME. New patterns in the otopathogens causing acute otitis media six to eight years after introduction of pneumococcal conjugate vaccine. Pediatr Infect Dis J 2010; 29: 304-309. Connors R 3rd, BosemanP3rd, Olson RJ. Accuracy and reproducibility of biometry using partial coherence interferometry. J Cataract Refract Surg 2002; 28: 235–238.